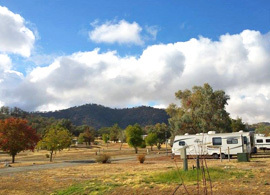 Sequoia & Kings Canyon RV Park is located in the Sierra foothills (about 2,000 ft. elevation). The closest RV park before the Sequoia/Kings Canyon National Park entrances, only 20 miles away! We are open year round, 30 & 50 amp full hookups, level pull-thru sites, large spaces, shower & laundry facility. We also have late checkout time at 8 p.m. Leave your rig here and visit the parks! Fishing, golf, and a convenience store are nearby. Rate is for 2 people. $2 per night for extra person. $4 charge for electricity and for rigs over 36ft. Member calls park directly when they are almost there to let park know they are coming. From Fresno, go 30.8 miles on E Kings Canyon Rd/CA-180 to the resort. Receive 50% off first night with 3 night's stay.